Over the weekend, my bf, a friend, and I drove to Pittsburgh to see Elizabeth Stanley (whom I worked with on a revival of Hello Again a few years back) play Grizabella in CATS at the Pittsburgh CLO. If a friend of yours is playing Grizabella a scant two hours away, how can you NOT see it? And, as I have posted before, I have a certain nostalgic fondness for CATS. So I viewed the production in Pittsburgh through a series of filters. I saw it as a nostalgic (and clearly neurotic) 12 year old, as a more season (and perhaps cynical) reformed theater professional, and as the supportive friend of a cast member. I also saw it through the eyes of my friends, who basically only know CATS as the show that surrounds “Memory”. Elizabeth Stanley was truly fantastic, exhibiting a richness and depth of tone in the lower notes I didn’t know she had and eliciting a justified rousing ovation before she even finished. Some moments tapped into that childish joy, like the train in “Skimbleshanks” (or, as they call it in France, “Edgar”) or the cast storming the aisles during the infectious “Mr. Mistoffelees”. But I also couldn’t help but share in my friends’ general confusion. 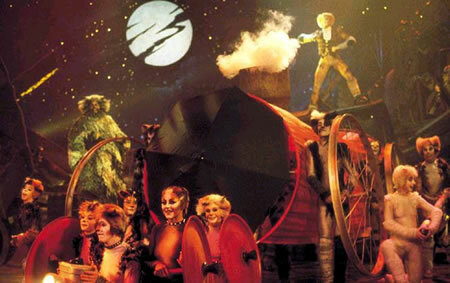 While I just sort if instinctively accepted the show as a child, when asked as an adult basic questions like “so what’s a Jellicle cat?” or “why was there a song about a pirate?” or “is anything going to happen, or are they just going to keep introducing cats?”, “why is this a show?”, I found myself unable to provide suitable answers. Matters weren’t helped by the fact that the production closely mirrored the original Broadway/London productions, but with a scant week and a half of rehearsal time. It felt a little like a copy of a copy, with a lot of things happening because “that’s how it’s done”, and other elements glossed over or hinted it. While watching I often wondered if there is every going to be a major revival that totally reconceives the show. Is there really any point? Is there a greater depth to be mined by re-invention? Or are the 80s “Flashdance”-styled costumes and choreography ingrained in DNA of the show?